Some people say you know you’re really good at something if it’s easy—effortless. Others say to be good, whatever it is you’re doing should feel really hard. It not only requires work, it should feel like work. I suspect the task has to be both—easy and hard, in layers, dancing together, trading places, making you feel bruised, confused and exhilarated when it’s all said and done. I know this is true for me when it comes to writing. Sometimes I can go through days at a time filled with easy writing—writing that just effortlessly flows from my mind through my fingers, words that come together as they should and mean what I’m trying to say. And of course, there’s a big part of me that would like writing to always be like that. I was always the kid who wanted things to be easy—who wanted to be first chair viola without having to diligently practice. But while the easy writing is enjoyable and satisfying, it’s also like a meal of empty carbs, providing short bursts of energy and contentment, but no deep, sustaining fuel. That’s when I know I have to step away from that comfy place to the land of writing that is less clear-cut and predictable. I think that’s the trick for people who have been writing for as long as I have (I’ve been using written words to make a living for nearly 20 years): You have to decide to open yourself up to the difficult work of writing. It isn’t naturally difficult, any more, and you certainly know all the tricks for making it easy. Making it hard again has to be a choice, and it’s a very critical choice to make if you don’t want to drift too far from the fire that made you a writer in the first place. I was drifting from that fire as I made plans for a writers’ retreat with my friend Jen (who I’ve known for longer than I’ve made my living writing). My book project, which is almost ready to send out to agents, had been sitting untouched for so long I had nearly forgotten what it was about. (When I finally sat down and read again what I had written so far, I was a bit amazed and perplexed by this person, telling this story.) A long-form essay I planned to submit to a compilation project had been started, then abandoned. And while I was keeping up, for the most part, here on my blog, it had begun to feel more like a task, less like a jolt of energy and joy. 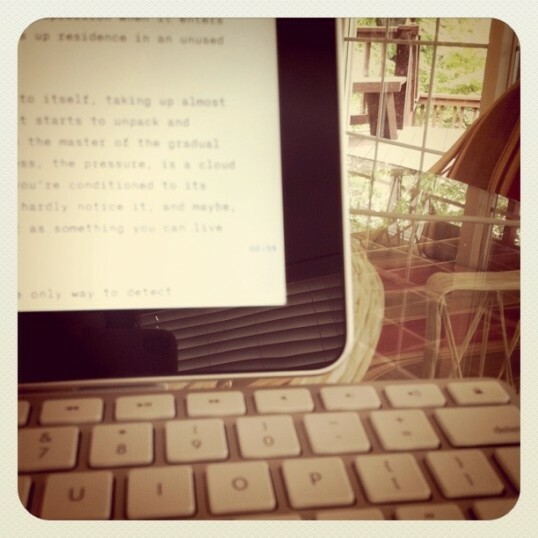 What I needed was to make writing hard, again. A week ago, I wouldn’t have been able to articulate that or known how to go about it. But now, after three days of deep-dive writing, I know. First I removed myself from my regular routine and surroundings, driving eight hours from home, listening to a great audio book on the way. That day of driving was like a palette cleanser, removing the aftertastes of home life, client work, routine. I read what I had already written, and then wrote. And wrote. I dove in, not with the goal of finishing an assignment or publishing a post, but with the goal of pushing myself deeper into the work and discomfort. I looked not for the easy way to describe something, but the very best way. I went out on limbs of metaphor and simile, not stopping in the moment to criticize my risks and convince myself to play it safe. I could always go back and revise. I will go back. But in those moments, the point was to let it rip. At the end of all that morning writing, Jen and I would eat lunch, talk, swim in the lake, read our books and marvel over the stories and sentences of great writers we admire. Then we exchanged parts of what we had written earlier in the day, questioning and pushing each other more. (And Jen is no-joke when it comes to pushing me. Last night she had me squirming in a corner.) If we had any energy left in us, we wrote some more, making revisions while the questions were fresh. By the time we said good night and I was lying in bed, reflecting on the hard work of the day, it was as if I had waged some exhausting but triumphant battle. I felt bruised and worn, but energized by the results, excited at the thought of waking up the next morning and making writing hard, all over again. That sounds incredible. Glad you two could get away and get some writing done. You’ve inspired me to do the same (although, in true form, I will be going by myself). I will say that reading y’all’s tweets has made me a bit envious, but in the good “wow, that’s such a great idea I need to do that” kind of way. For me, the familiar spaces carry far too much emotional baggage to hack through, and I need to uproot myself from its clutches. Writing needs new perspectives, fresh eyes, and a good sounding board. I can’t wait to go on my own writer’s retreat soon. That sounds AWESOME! And I’m so glad to hear that there’s longer writing in the works. Your blog posts are such good reads, I can’t wait to read what you write given the space and time to go deeper! Love this! There definitely needs to be a balance of the easy and hard writing days but our art doesn’t benefit if we stay in either extreme. It sounds like the time away was exactly what you needed. I needed to read this today. Some of the metaphors have grown stale and show the stretch of overuse. Time to make it hard again, to go back to the creative part of the creating. Thank you. That discomfort for me ends up being productive … but I find that I try to convince myself to avoid it. Thanx for this post, I needed to read this today! Hey KT! Glad to hear that you went all Thoreau on us – Sounds brilliant. Reminds me of college and moving the dorm furniture around . . . just to study better. I also really like that you had the buddy-system in place to do your hard work. I bet that you’ll both talk about it when you are in your 70s. BTW, typing a story on an ipad with a keyboard – so portable and so easy. All you need is some fancy text at the top of the screen — “Underwood” or “Royal”. My dear Kristin, your readers again astound. They know you, and they are pushing me to write that book because they want more from you! It was hard for me, too, and so so great as well. I think we structured our time smartly and spent it doing all we knew we needed to do, not just play on the lake. Thank you for coming with me and for being who you are. Once you make it harder, it slips back into the easy. I will be asking for a chapter in a week. K? Loveyouthanks! So glad you two were able to make this week happen. It should be a regular occurrence. I love that you are friends. I love that when you get together you are real. I love that you are both serious about your work. Love your reflections here. I have the same relationship with teaching/coaching. I can always stick with the old stand by sessions/practices, but to push myself and my craft and really grow as a coach/teacher, I have to open myself up to making it HARD again and really ask the right questions, etc. Excellent work here Kristen. Seriously LOVED this. The idea of a writing (or creative) retreat is very enticing. I’m looking forward to a vacation with my wife soon (w/out the kids) and I hope to do some “cleansing of the palette”. Thank you for sharing a piece of your writing story. Godspeed. Preston, isn’t it amazing how easy it is to slip into those ruts and take comfort in those patterns? Thanks for *getting* it. Roxanne, I’m so glad it was helpful! I didn’t realize how much I had been avoiding the difficult writing until I sat down and faced it—a difficult task for the mind and heart, but good for the soul. I’m envious. And inspired to make something like this happen. KT thanks for saying you’d be jealous if it hadn’t been you. :) Because I so am. Summer is my brain dead time (in this stage of my life) although I did do some morning pages/journalling earlier in the summer. It’s so good to have a life-time friend to share in such work. I admire you both for making the time to get away and work hard. There have been occasions when I lamented the easy writing: I was the sports editor of a small newspaper for several years. Then, later, when I applied for a job a really wanted the samples of my sports writing were competent, but shallow. “Why didn’t I work harder on that piece?” I thought, realizing it could’ve been so much better. Recently I had to send a link to a prospective client. It was from my blog two years ago and again, same thing: adequate, but not great. There was no time to improve the piece, the client was waiting to taste a sample–a very specific sample. Sigh. Enough about me–good for you! “Writing is easy. All you do is stare at a blank sheet of paper until drops of blood form on your forehead.” ~ Gene Fowler. Jennifer, you’re right—once you dive back into the hard work, it begins to feel more natural again. It’s just that initial hurdle that’s tough, and I’m so glad you were there to help get me over it. ThatGuyKC, I think the palette-cleansing and other forms of retreat can be so important, even if the purpose of getting away isn’t to focus directly on your writing or art. I hope it’s a great time away for you and your wife. I’ll definitely be in touch about my book progress—would love to have your feedback! Joy, envy can be a great motivator, can’t it? :) You should definitely plan something—I’m sure you can find a writer friend or two who would love to join you. sarah louise, we all have our seasons to slog through—it’s good to recognize when yours is and to just try to roll with it rather than feel endlessly frustrated (easier said than done!). Anyway, my crazy season is spring, so it was perfect to have a few days set aside focused on shifting gears. Maybe you can plan a journaling/writing get-away in the fall? Thanks, KT, for this blog post. This would be a great piece to share with my 9th grade students, many of whom find writing REALLY hard all the time. Little do they realize that many of them are writing constantly…notes to friends, texts, to-do lists, etc. It would be good for them to see that writing is both difficult and easy for all those who strive to capture the written word. So what, pray tell, are you working on? Can’t wait to read it, no matter what it is! This is just another way to say what you’ve already written, but I think when things feel too easy it means we’re in a place where we can push ourselves some more. Sometimes things are naturally difficult, but when they get easy and comfortable, it means we’re ready to grow some more. I need to keep this on my mind.